To celebrate the end of Olimax’s PortrATE show at The Outside World gallery, we had a little party and once again I did the food. I made up some Makizushi – rolled sushi in nori (black seaweed). 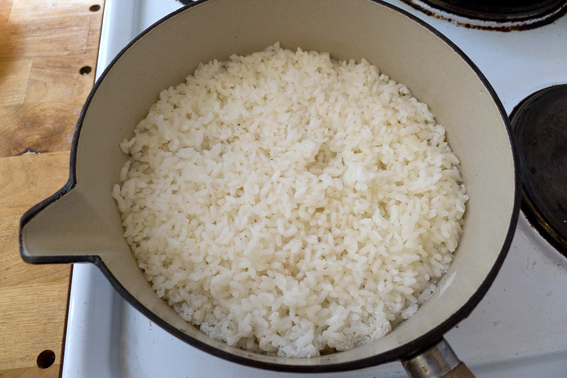 First I rinsed and cooked some sticky Japanese rice and sprinkled on some mirin (rice wine), while it was cooling. 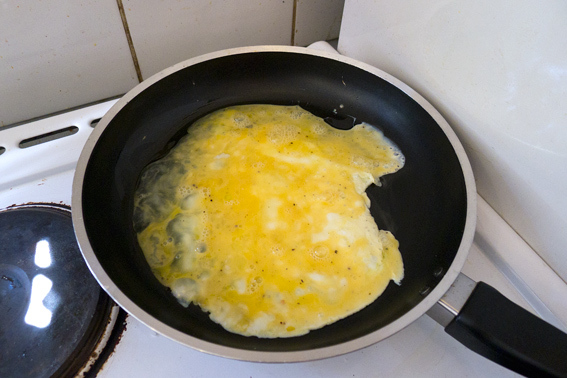 I cooked a very thin omelette with 2 medium sized eggs and added a little salt and black pepper. 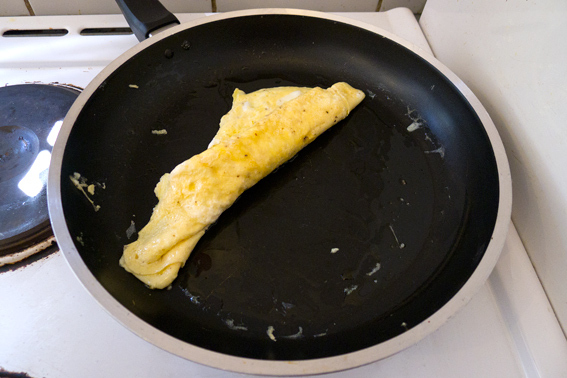 Instead of folding the omelette French style, I rolled it up. I wish I could say I cooked it using chop sticks, as the Japanese do, but I couldn’t find any chop sticks in the kitchen. I also peeled and chopped up some cucumber into thin strips. Using a makisu (bamboo rolling mat) I made two types of sushi roll with rice and the omelette and cucumber. 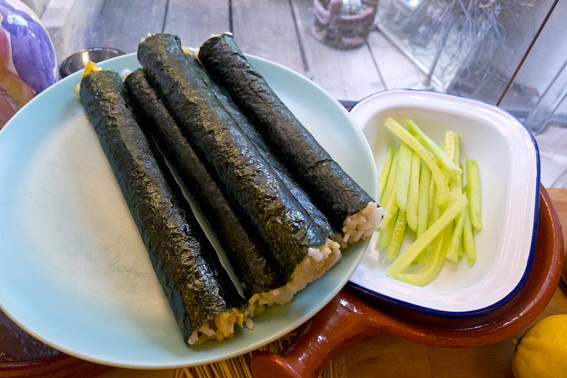 This is done by laying a sheet of nori on top of the bamboo mat and adding rice with the cucumber or omelette in a similar manner to rolling a very large cigarette. The mat helps in rolling the makizushi evenly. If you wet the end edge of the seaweed, like sealing an envelope, the roll will stick together. It’s worth leaving it fro a few minutes before cutting into 2 inch pieces. 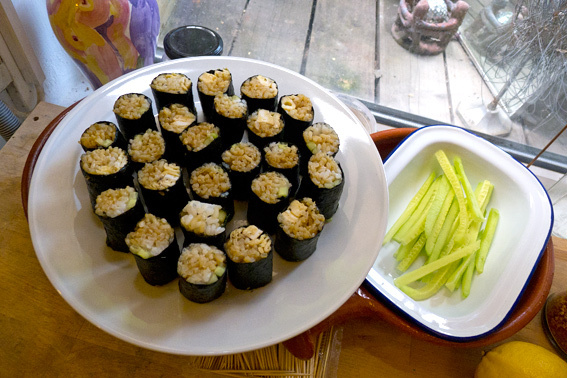 I flavoured the rice, during the rolling process with some Thai fish sauce and a mixture of wasabi and soy sauce. This isn’t considered good sushi etiquette – normally wasabi is added to the rolls and then they are dipped into soy sauce just before eating, however, the makizushi was intended for about 30 people in a short space of time without much room for extra bowls. I drew on inspiration from an Anthony Bourdain programme called No Reservations – Tokyo, where a top Japanese chef pre flavoured all his food for diners. Whilst the soy sauce discoloured the rice and it didn’t have its usual aesthetic purity, the makizushi tasted fantastic! 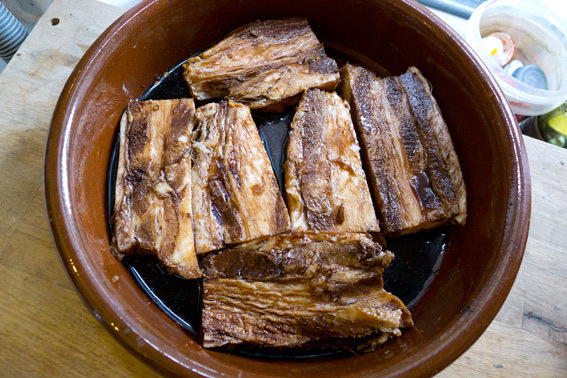 We had some leftover pork belly, from the Tuesday opening, so I marinaded it in teriyaki sauce for a couple of hours, cut it into bite sized pieces and flash fried it with some bean sprouts and crushed chilli. 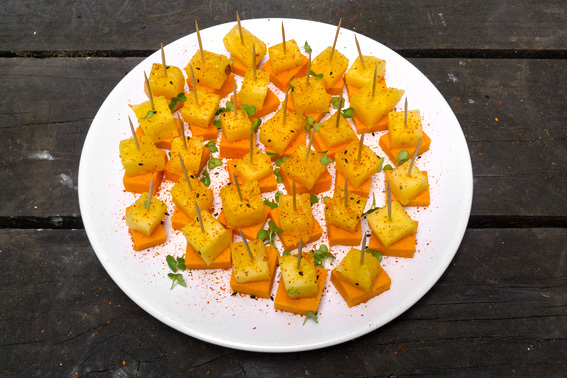 I turned a rather naff old fashioned party snack, cheese and pineapple, into a very chic dish by sprinkling the cubes with mixed chilli and watercress tops. 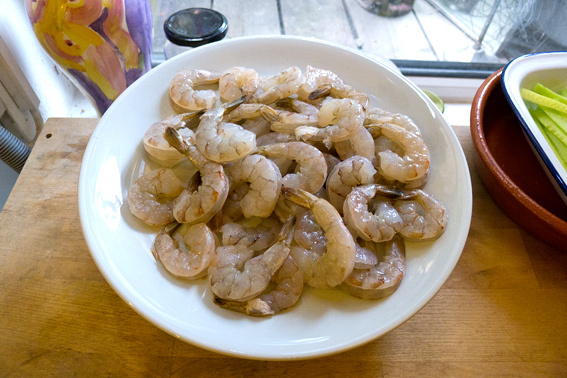 Additionally, I flashed fried some prawns in olive oil, with chopped garlic and crushed chill. The very popular baby octopus and frogs’ legs, from the Tuesday opening, were also served. Nigel Burch and Dylan Bates of the Flea-Pit Orchestra played music throughout the afternoon. This entry was posted in Fish, Food, Meat, Recipes and tagged Anthony Bourdain, baby octopus, bean sprouts, cheese, chilli, cucumber, Flea-Pit Orchestra, frogs' legs, garlic, Japanese, makisu, makizushi, mirin, Nigel Burch, No Reservations, nori, Olimax, olive oil, omelette, pineapple, pork belly, PortrATE, prawns, rice, seaweed, soy sauce, sushi, teriyaki, Thai fish sauce, The Outside World, Tokyo, wasabi, watercress. Bookmark the permalink.